A large brick hearth style arch over the range was a must have for the homeowners. 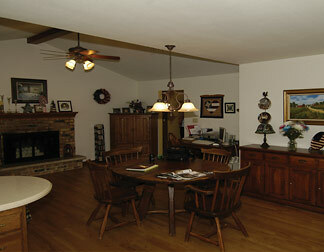 The arch, the focal point of the room, was built from plywood and then veneered with English Pub Thin Stone. 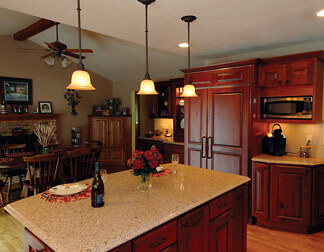 The arch also functions to conceal the blower vent, necessary to properly vent a commercial grade range. 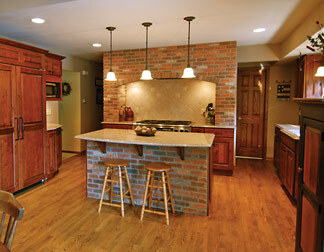 A new island provides seating for four and was finished with brick veneer to compliment the arched wall. 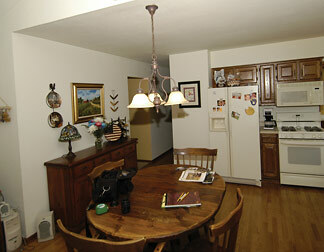 The small 1980’s kitchen was transformed into a high-tech cooking center, but laced with country charm.